Birthday: December 25 Height: 139 cm Weight: 29 kg Sizes: 72 - 45 - 68 Species: Electronic Warfare Angeloid The second mysterious angel that descends from the sky who possesses transparent wings shining in seven different colors. She has a selfish personality, and at times, she has a tsundere nature. 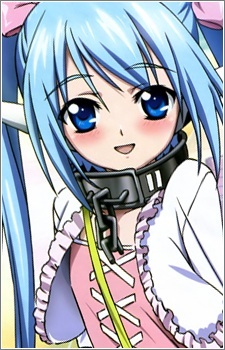 Nymph was originally sent down to Earth to capture and retrieve Ikaros. Her first attempt at this failed, ending in Ikaros being completely unrestrained from her previous restrainments making her realize she was a mere "Pet-Class Angeloid". Nymph's 2nd attempt never actually found place, since she was repeatedly distracted by Tomoki's attempts to earn money on the Sakura Tree Festival. This, evidently, led to her falling in love with Tomoki, and she decided to stay. Nymph's original master, "The Master Of The Skies" found her passive refusal to proceed with her mission to be a reason to "scrap her", and he sends Gamma to retrieve her. They fail to do so, leaving Nymph with ripped-off wings and an unattached collar, meaning she doesn't have a master anymore. Later she grows them back during their fight with the second generation angeloid Chaos. When Tomoki ordered her not to die, she was so happy that her wings grew back more beautiful than before.